Water levels are continuing to drop nicely upstream and it's looking like we'll have a decent number of sandbars above water by Friday with more coming out as the weekend progresses. It's pretty likely you'll be sharing some of the larger sandbars with new friends but at least they'll be out there. Temperatures are expected into the 90s with a bit of rain overnight Saturday. Not terribly ideal but at least things are going in the right direction for the rest of summer! It's official, we're out of commission well into next week. We're expecting over 40kcfs of water on our stretch of river by the middle of this weekend. Just a couple days ago we were at 5kcfs and our cutoff is 15kcfs so you can understand why seeing 40kcfs in the NOAA predictions makes cancelling all trips an easy call even a week out. Here's a good idea of what's coming with kcfs numbers on the right of the graph: To put that 40kcfs number in perspective, that's 300,000 gallons of water flowing past each second of the day. Between the first rise and when we're expected to get back to normal? 16,956,000,000 gallons. 17 billion additional gallons of water in 10 days. That's enough to fill 1.7 million backyard swimming pools and you'd still have a river running at normal rates. 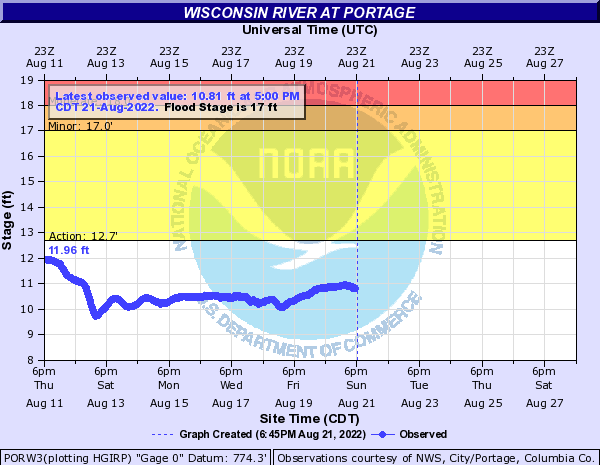 That 40kcfs moving through the Wisconsin River is likely to be the highest ever recorded on that date. What happened? 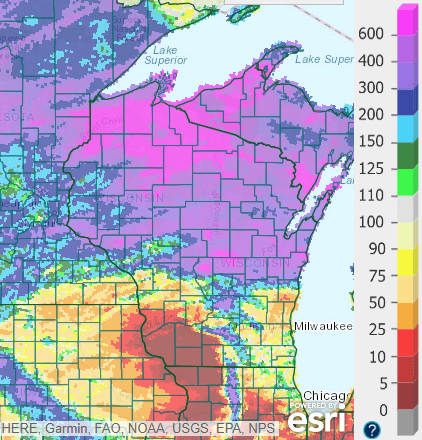 Northern and central Wisconsin have been getting hammered more often than not this week. They're currently looking at 600% of the usual amount of rain in the past week and our watershed runs right up the middle of it. Turning it up to 11 This early in the summer the vast majority of central Wisconsin is still mostly barren cropland. While the forests and grasses have long been fully leafed out, these brown fields allow a significant amount of that rainfall to go straight into the river system/watershed without getting absorbed into the ground (this is also when you'll get all of the algae blooms and drop in water quality from farm runoff). As these farm fields become fully grown, that water absorption rate goes way up and these storms create far less trouble downstream. Unfortunately, we're still a couple weeks from that happening and thus the massive spike in water levels from our relatively low base a few days ago. The image below shows what happens between May (brown), July (green), and two days ago (mostly green) When will it be over? This is our $10,000 question (because that's about how much we've refunded this week). I'm hoping we'll see warm sunny skies as much as possible over the next 12 days in which case the river will take a steep dive right before the last weekend in June (the start of our peak season). How likely is that? Eh, I'm a little hesitant to guess, it's just too soon. The current predictions by the people that are paid to know these things say approximately next Tuesday but they also don't take weather forecasts into account beyond 24 hours. Realistically, I'd say this will be pushed back to Thursday or Friday based on the 10 day outlook statewide. It does help that we're getting closer to the heart of summer so when things start to drop, I wouldn't be surprised if they drop fast. There's also a lot of wishful thinking here - it's never fun to see a wrench thrown into everyone's plans. Well…shoot. A lot can change in 48 hours. The overall volume of water in the river system is tripling (or more) right now. New readings coming out of Castle Rock upstream already put us underwater and it'll only get worse as the next few tributaries up the numbers before this water gets to us. Trips through Thursday are officially cancelled due to high water. 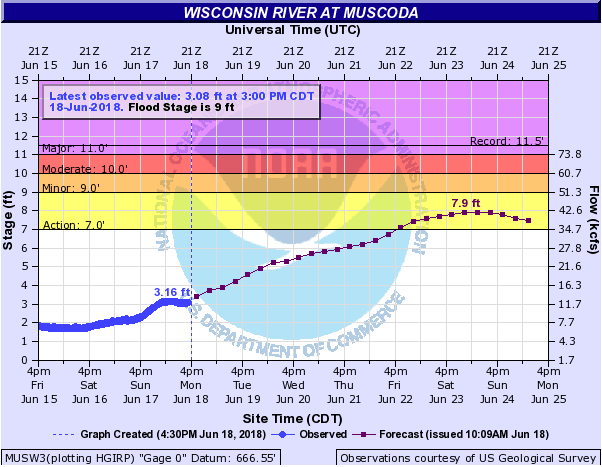 Too soon to know exactly when they'll drop back down below sandbar level but we should get an update within the next couple hours on the graph below (aiming for 13.5 or less). Right this second I think we've got a 65% chance of losing the June 23/24 weekend. The hope is that the larger than expected release now means they'll dump enough water to be able to drop back down before the weekend. Wait and see I guess. We've got a pretty unstable forecast in the sense that the National Weather Service doesn't have a lot of confidence in it. The current climate models have come up with different conclusions about what's going to happen when and with a stationary front, small changes could have a big impact. Yesterday the entire weekend was expected to be almost completely dry. Today the forecast says thunderstorms and rain more often than not. Long story short, it might rain, it not. It might storm, it might not. I assume we're getting rain and a little thunder at some point but I'm cautiously optimistic it won't be an all day thing. I'd recommend checking this forecast every 12 hours or so to get the best idea of what's gonna happen.